Are you tired of always having to cover up your legs due to unsightly varicose veins? As many as 40% of women and 25% of men suffer from varicose veins. Each year over 1 million people undergo surgery for their removal. Varicose vein removal is performed by our doctor for patients from Palos Verdes, South Bay and throughout California, so you can feel better about your appearance. Symptoms associated with varicose veins include aching legs, burning and itching around the vein, swelling, and in some severe cases, ulceration and bleeding. Veins that cause pain or are cosmetically unappealing should be treated. Surgical techniques include ligation or tying off of a vein and stripping or removal of a long segment of vein by pulling it out with a special instrument. It has been the treatment of choice for larger veins. The surgery may be performed using local, spinal or general anesthesia. Most patients return home the same day as the procedure. Ambulatory Phlebectomy is a method of surgical removal of surface varicose veins through tiny incisions made in the skin, along the treated vein. The incisions are so tiny that stitches are generally not necessary. The procedure is usually performed under local anesthesia and has few complications. This procedure is often recommended in conjunction with sclerotherapy. It can minimize the side effects of sclerotherapy and enhance your results. 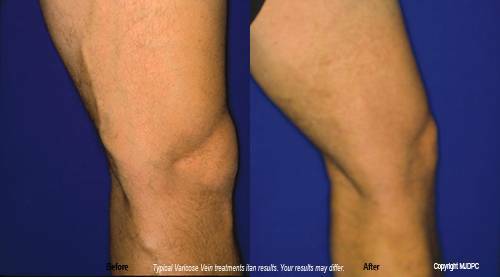 VNUS® Closure® is a minimally-invasive alternative to traditional vein stripping surgery. The procedure utilizes radio frequency (RF) energy to heat the inside of the greater saphenous vein (GSV), causing it to collapse and seal shut. During the procedure, our physician inserts a tiny catheter, with an electrode tip, into the affected vein. Once in place, RF energy is delivered to the vein wall. Gradually, the catheter is withdrawn, sealing the vein along the way. Since Closure occludes veins it virtually eliminates reflux and unsightly varicose veins. The complete procedure takes about 30 - 45 minutes. After your treatment, our doctor will most probably ask you to walk, wear compression stockings and refrain from long periods of standing for a few weeks. Most patients can return to normal activities immediately. NOTE: This does not include vigorous workouts. Endo Venous Laser Treatments: ELT, EVLT and ELVeS are all names for minimally-invasive procedures that utilize laser energy to heat the vein wall, causing it to collapse and seal shut. During the procedure, our doctor inserts a thin laser fiber optic directly into the vein. When the laser is pulsed, the energy causes the vein to become permanently occluded, thus removing the underlying cause of the varicosities. Gradually, the fiber optic is withdrawn, sealing the vein along the way. The complete procedure takes about 30 - 45 minutes. Patients can return to most normal activities immediately. What about Sclerotherapy for varicose veins? Sclerotherapy is an excellent, safe, non-surgical way to treat spider veins. It involves a series of relatively painless injections of a solution into the abnormal vein in order to make the vein shrink. The solution irritates and damages the lining of the vein, causing it to close up and virtually disappear. Normal activities can be resumed right away. 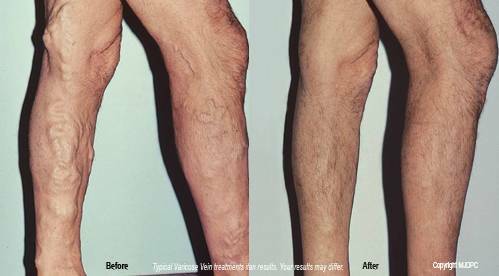 What results can you expect from your varicose vein treatment? With the evaluation and treatment methods available today, varicose veins can be treated at a level of effectiveness and safety previously unattainable. 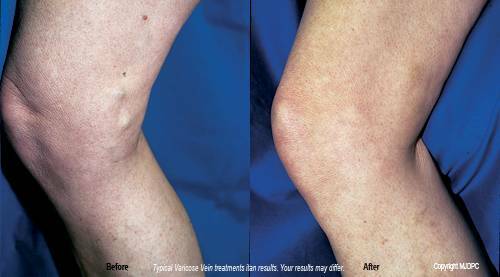 After our doctor performs varicose vein treatments, most patients see their results immediately. How do I know which varicose vein procedure is best for me? Schedule a consultation with our office. We will review your complete medical history to determine how long you have had the problem with your veins and the severity of the problem. Our doctor may test to determine the extent of your venous insufficiency and explain which procedure is best for your condition.